Both ladies look lovely. So different in their styles, but well suited to each one. 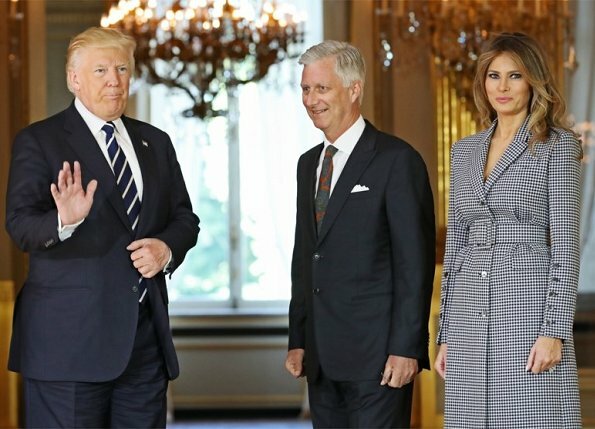 Love the style of Melania's Coat Dress. Only tall ladies can pull off such a wide belt. Vous pourriez faire des sourires à cet homme ? Je pourrais l'etrangler avec plaisir, et son hypocrite d'epouse aussi. 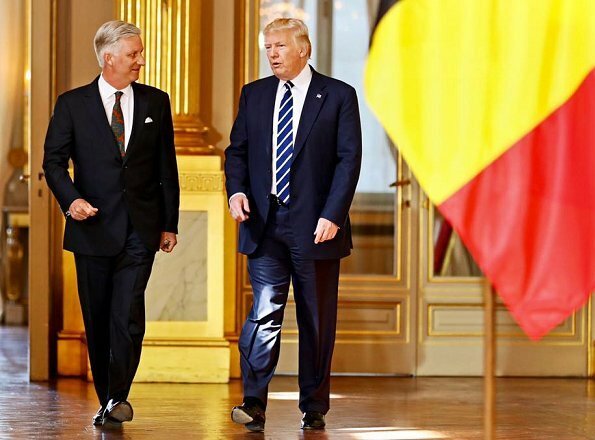 C'est pas drole, parfois, la vie de roi..........I want to vomit to see that pair there, the ignoramus who called Brussels a 'hellhole' and Belgium a city. Well, they also smile to the king of Saudi Arabia and the emir of Qatar. Are those better than trump because they are royals? Lizzie your rude unwelcome comments are disgusting. This is not a political forum. It is a fashion forum! Shame on you. You are calling the FLOTUS vulgar and common. Well that describes YOU not her! 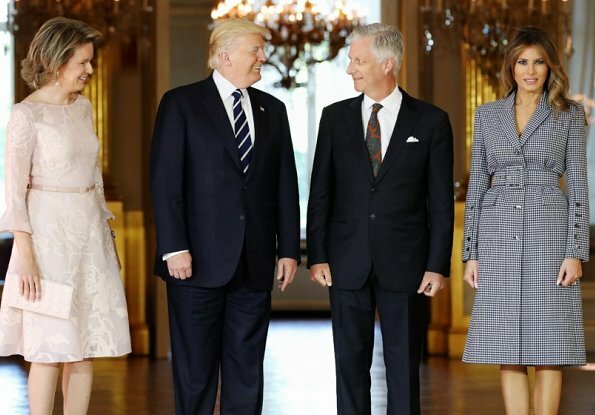 I like Melania's dress--feminine and flattering but also serious/business-like. Mathilde looks fine as always. Wow, what a hateful comment. Very demeaning to people you don't even know. 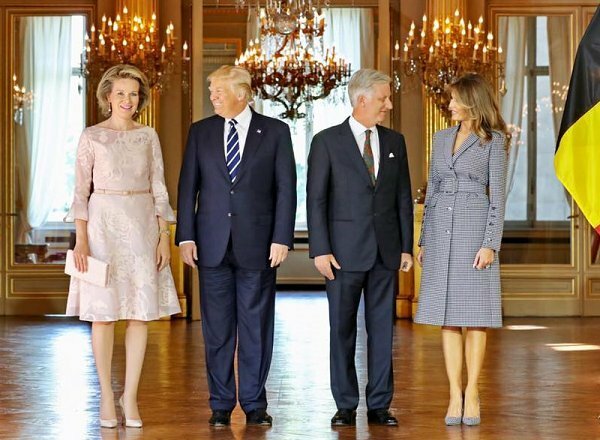 Mathilde and her husband appear to be most gracious hosts to the Trumps. Their manners, regardless of politics, ought to be emulated by us all. Mathilde looks the lady, as always. So does Melania, who is the opposite of vulgar or common. Lizzie, this is a fashion blog, not a political blog. Leave your politics off of it as not everyone agrees with your political hatred for those you don't agree with. My goodness, what a rude remark. So totally inappropriate. Each to their own. Would Melania have married Trump if not for his money? I doubt it. 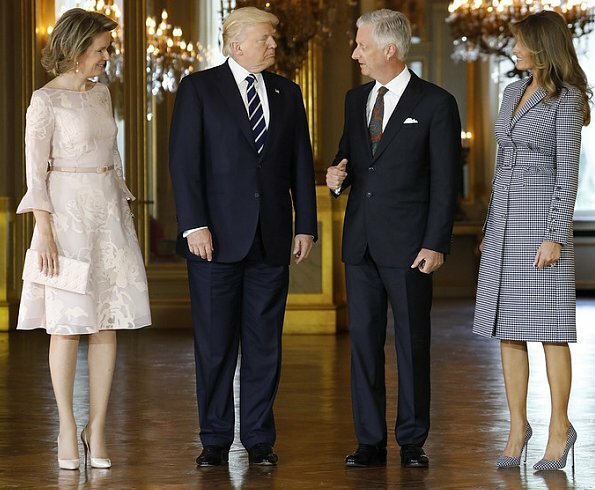 As for the ladies ensembles, Mathilde's dress is pretty but too pale for my taste and Melania's coat dress looks as though the sleeves have been sewn on back to front. It's me!, again another hateful comment about Melania Trump. This is a fashion blog. Not everyone agrees with your politics. Stop assuming everyone agrees with you. As this is a fashion blog the political comments should be omitted. There are other venues for that. I agree, Heather. It is a shame people live their lives for politics and can't give it a rest for even a few minutes of their day. However, both Ladies are good looking, although I really prefer Mrs. Trump's outfit (would choose this for business for myself too) Wow! Wow!!! your comments are unjustifiably insulting.The ladies look beautiful, and so do the men. Wow, Mathilde's dress looks so lovely. Love its softer color, those sleeves make this dress look more interesting. Very beautiful. I don't like Mathilde's dress, the cut us unflattering, the color is blah, and the material reminds me of an old fashioned satin pillow. Mrs. Trump has a figure that can carry almost every style, however those high belts that she favors, make her look very awkward, I do like the dress, I adore the shoes, and find her hair horrible, it reminds me of the models on the cover of risqué magazines, or calendar girls. The colour is really blah, I'm so fed up with all those boring beiges and nudes. And spanx is your friend, especially underneath dresses like this one. She always reminds me of the duchess of cambridge!! Chippy I also don't know why. I don't see much similarity between them. I think Catherines aura is much different from Melanias. The American president and his whole family remind me of TV-soaps like "Dynasty", if you know them. (John Forsythe as Blake Carrington and Joan Collins as Alexis and so on.) in contrast to them Catherine is a very british lady, I think. I get what you say that trumps are dynast tv-soaps but they were elected by the people of US in a landslide majority!!! I know that Trump was elected (still I as a european don't understand that system with the electors, did not Clinton get more votes?). But compare this family to the Obamas. The Obamas seemed quite down-to-earth and Michelle so natural. Melania always reminds me of the duchess of cambridge!! Je suis tout d'accord avec vous, Lizzie. 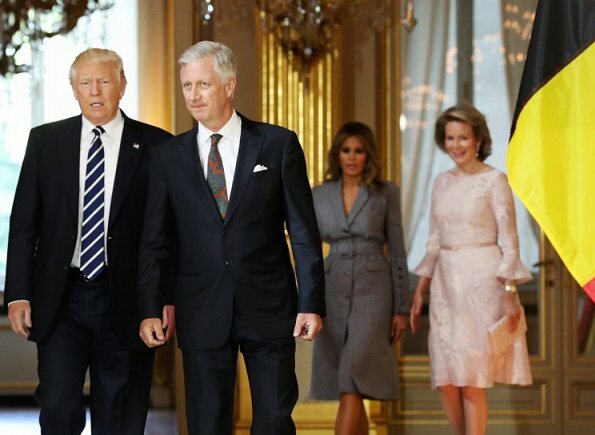 Vous êtes très bien informée sur la politique Américaine même si vous êtes française/belge. Merci pour votre commentaire! - Une Américaine qui a vraitment honte. Anna and Lizzie: It is just not appropriate here. Keep your political opinions for yourself or share it on another blog where one can discuss those things. Here it's all about fashion, outfits, style... Enough hate and tears on this world already. Would be nice, if the editor could take care more... Thanks. Lot's of Light! I 100% agree with Carla and rainha leonor. Anna and Lizzie are nothing but bitter uneducated women that take pleasure in putting down a lovely stylish woman like Melania only because they don't agree with President Trump. Shame on both of you. Je suis tout d'accord avec vous, Lizzie! 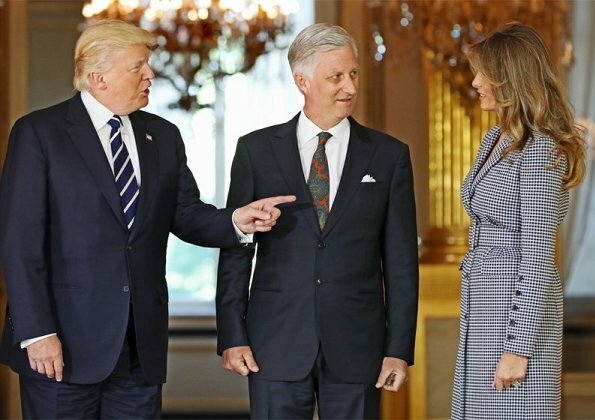 Vous êtes très bien informée sur la politique Américaine même si vous êtes française/belge. Merci pour votre commentaire! - Une Américaine qui a vraitment honte. Since this blog is about fashion, I am sure you are wearing your pink bunny cap all day. I am truly embarrassed by your comments. Go to your safe space please. Melania looks odd in that outfit. It's not her usual style, more like something we'd expect from the Duchess of Cambridge or Crown Princess Mary for an outdoors event. Plus it's not very flattering to her shape- it makes her look very short--waisted. Mathilde's outfit is better, but not by much. I think it's too frilly for this occasion - it belongs at a baptism or wedding. And again, it's not that flattering to shape. Mathilde always looks her best, in more feminine designs, like this.